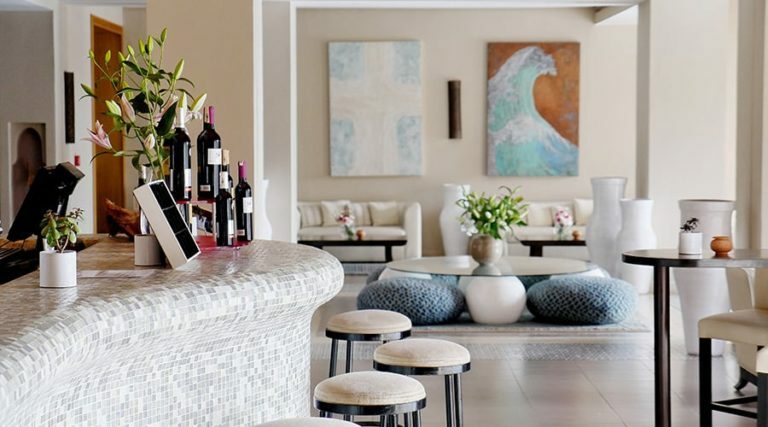 Best for: Surfing and a relaxed, family-friendly vibe. Not for: Anyone looking for the intimacy of a pre-organised group retreat – this is a DIY, resort hotel experience. Takes up to 270 adults & 103 children. People of all ages come to Paradis Plage for surf, spa, yoga, wellness and total relaxation. 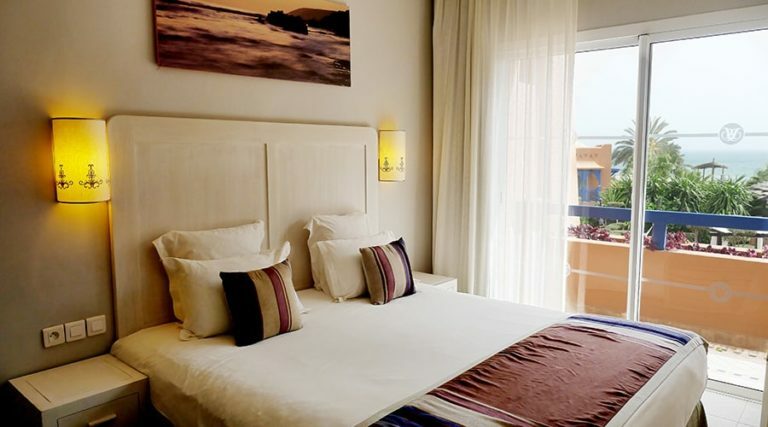 A 40 minutes drive from Agadir, it boasts almost year-round board-short weather and has 95 suites, plus villas and apartments nearby spread across three hectares of tropical gardens. 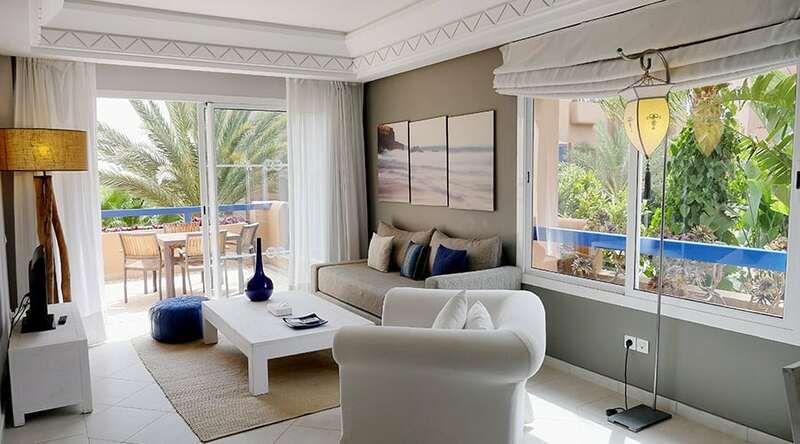 Most benefit from spectacular panoramic sea views, and a cooling breeze off the Atlantic Ocean. 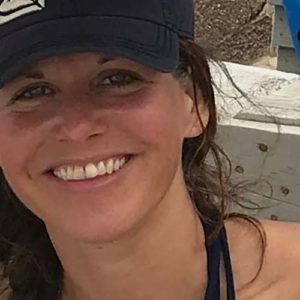 It’s particularly good for active families, and has omething for all ages and interests with an energetic team of instructors leading surf, yoga and fitness classes. For surfers the Rip Curl Surf House is 100m from waves that are perfect for children and beginners. The surf, and access to beginner waves on the hotel’s sandy beach which has no rocks and no rip tides. 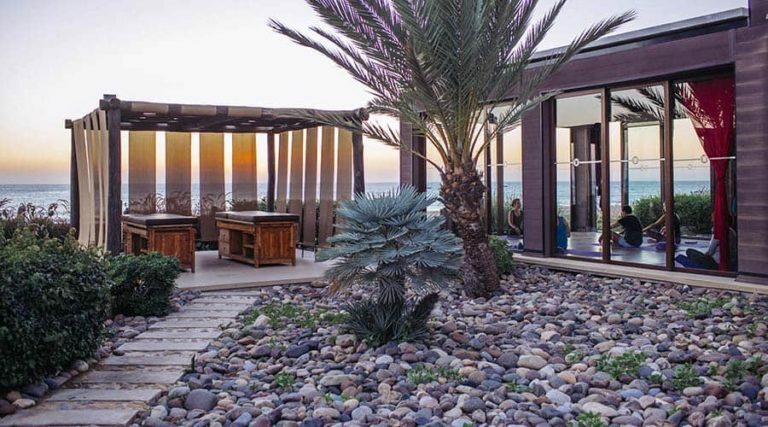 The yoga shala, with its floor-to-ceiling sliding glass walls, and beautiful palm-fringed beachfront location. The traditional Hamman. This is Africa, so power cuts, bugs and last minute changes are to be expected. For those looking for truly authentic Moroccan experiences, be prepared to venture out of the resort to nearby villages. For any non-dog lovers, dogs under 5kgs are permitted. 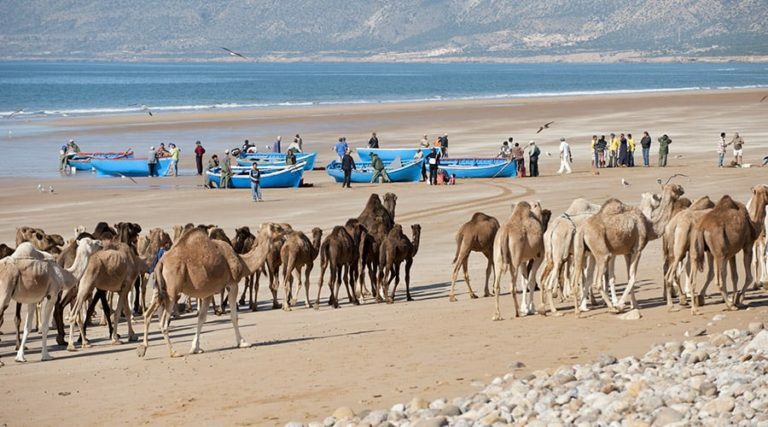 Sally Kirby reviews this family-friendly surf & spa resort on one of Morocco’s best surfing beaches at Taghazout, near Agadir in Morocco and finds the teaching and vibe she needs to shake off her fear, play and reconnect. Come here to create you very own DIY retreat. Swimming, surfing, stand-up paddleboarding, indoor and outdoor fitness classes, and yoga are at the heart of Paradis Plage’s on-site activity schedule, and there’s an extensive spa to help you relax. There are three 75 minute sessions a day, six days a week, usually guided by the enthusiastic and dedicated resident instructor, Karsten, who teaches an accessible dynamic flow in the morning and then restorative deep stretch in the afternoon open to all levels. He adapts the class to the group, and sometimes beginners and children join for a session post surfing just to have a go. Experienced yogis also love these classes. 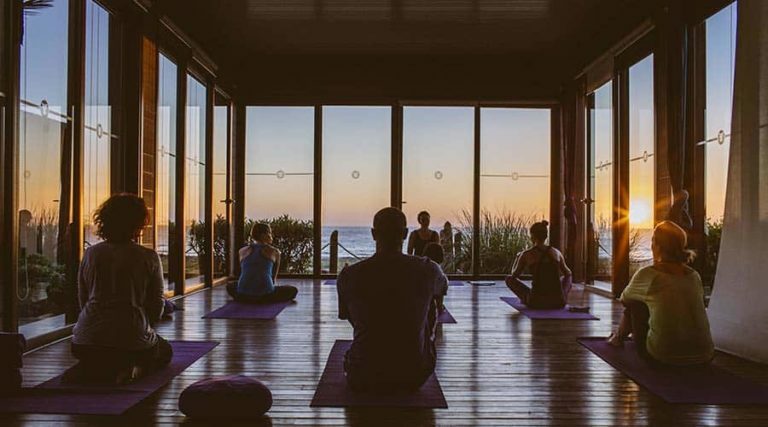 There’s an energetic, awakening class at 8am, a workshop style class at 11 am where attention is paid to individual postures and there are rest stops for integration, then the 5.30pm sunset class is a restorative session, where you will hold poses to encourage more opening and relaxation. Pay on a class by class basis – the first class is 150MAD, subsequent classes 120MAD. Alternatively choose from 2 day and 5 day packages of classes. The Surf House is open from 9am to 7pm and staffed by a friendly team of passionate local surfers led by Karim Elbihi, who developed strong organisational skills whilst coordinating the African regions for London Olympics 2012. His team offers group sessions, private lessons and surf guiding for more experienced surfers. Beginners will feel safe learning on the hotel’s sandy beach; no rocks, no rip tides and gentle waves. For experienced surfers and group sessions, there’s a fleet of SUVs (vans loaded up with surf boards and Bob Marley tunes) ready to take you to find the best spots. The choice is vast – fabled surf spots like Anchor Point, Hash Point and Killers are pretty much on the doorstep. Spa manager Marie-France presides over a small troupe of Moroccan therapists (English is basic – smiling and arm waving sorts out most questions). The underground spa has a wonderful embracing feel. It’s by appointment only, and every visit becomes a ritual. Indulge in their two hour ‘Ritual Decouvert’, which includes a traditional Hammam scrub, full body massage and relaxation in their sensory chamber with a chromatherapy ceiling, gorgeous colour shifts, and aromatherapy infusions. 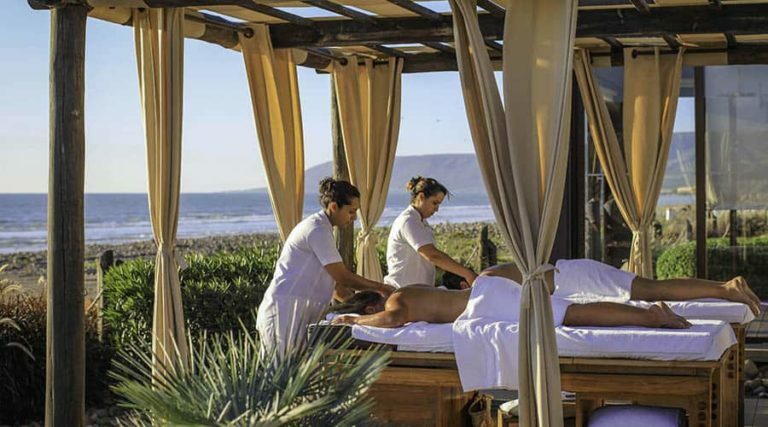 Treatments are mostly traditional and use local ingredients and products such as argan oil and orange flower massage oil. International massages including Balinese, abhyanga, shiatsu and Thai are also on offer. There are outdoor massage beds available in the garden gazebos if you prefer your massage al fresco. Mani-pedis, waxing and basic hairdressing services are available. Free exercise classes run each day including Crossfit, Body Combat, Body Pump, Body Sculpt, TRX, beach running and body conditioning classes for your Waist, Abs and Buttocks or Thighs, Abs and Buttocks. A weekly schedule is posted at reception, and Hamsa, who runs the programmes, is also available to tailor classes to any specific requirements. 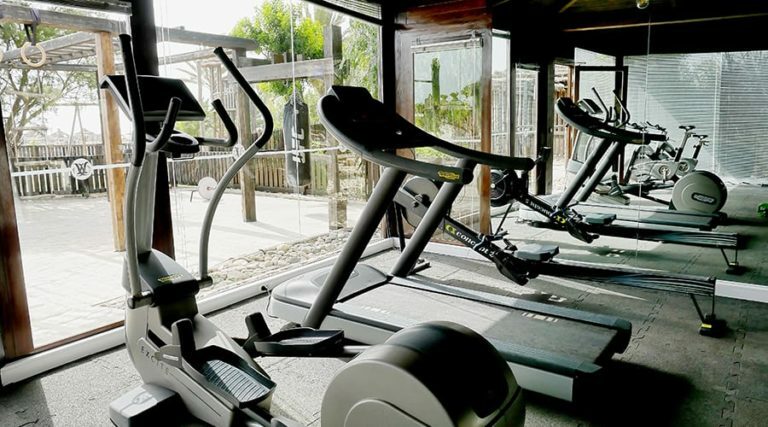 The gym has bike/ running/ vibration machines, as well as weights and stretch balls. An outdoor training area has further equipment including ropes, parallel and monkey bars. The beach out front is perfect for barefoot walks and running. 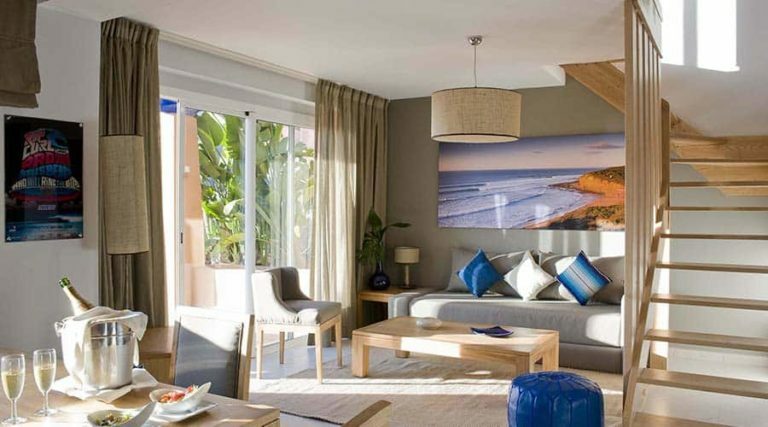 Paradis Plage is hugely family-friendly. The Kids Club caters for 4-11 year-olds and is open from 10.00am – 1pm and again from 2-6pm. It’s very much guided by what the children want to do – Sana, who looks after them, will play games with them, take them on a Treasure Hunt, make sand castles, or go to the on-site children’s playground. There’s a small football pitch which doubles up as a volleyball court and beach games are also organised. Older children and teens often go to evening yoga sessions too, or you can book private lessons. Most evenings you can watch a movie near the Surf House, often in French with English subtitles. Nearby day trips to Paradise Valley, for hiking and waterfall swimming, and exploring and sand surfing in the desert dunes near Imsouane, are also highly recommended. Other places to stay: If you need more space, there are four Beach Bungalows with private gardens that have direct access to the beach. A separate complex, a short walk from the main resort, has three bed villas and two bed apartments and is ideal for larger groups. 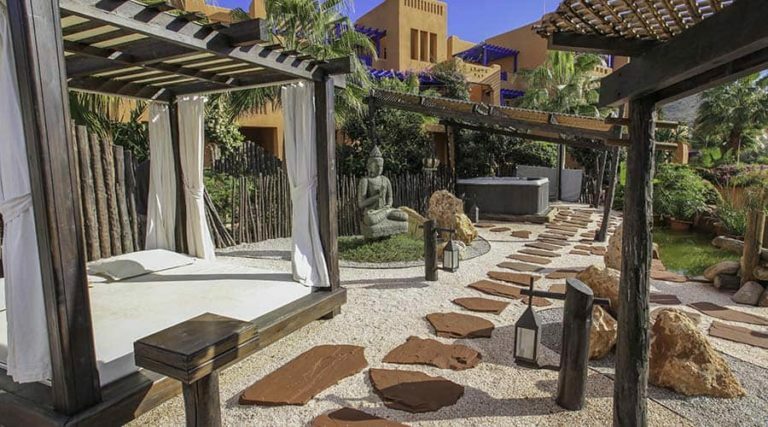 Other spaces to be: Throughout the hotel gardens there are day beds, sun loungers and bean bags for relaxing under the shade of gazebos and palm trees. For local Moroccan experiences, venture out to the nearby bohemian village of Taghazout to explore beachside cafes and surf shops. Ask one of the surf team to take you to the fishing market next door to the Surf House – the fisherman come in around 9am. Buy your fish, and the restaurant adjacent to the hotel will cook it for you. Morocco’s South Coast boasts 300 days of sunshine a year. During the hot Summer months (June-Sept) there is a cooling ocean breeze. For experienced surfers, the Atlantic swell brings the best surfing waves from September until April. 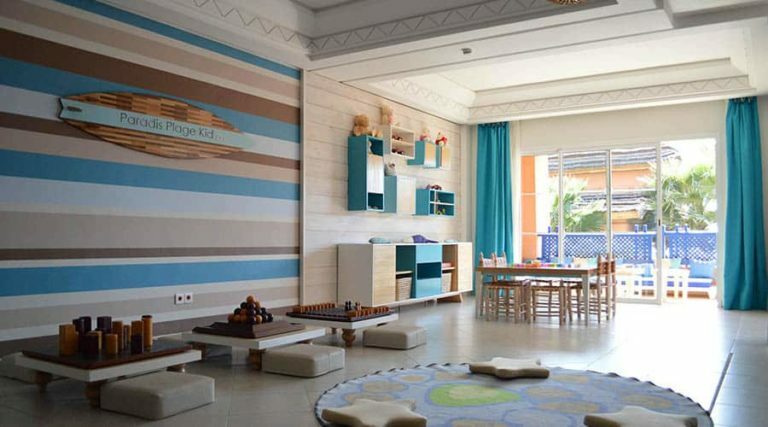 Being a family-friendly hotel, European and Moroccan school holidays will be busier than other seasons. They’re open year-round. 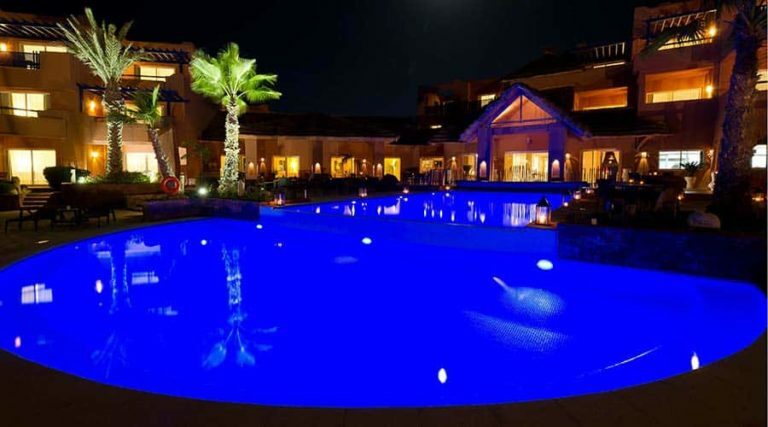 Public areas: Paradis Plage is a mix of modern international style with a twist of traditional Moroccan. Light and shade are a key part of the design, and the lights throw shadows as effective as artwork once the sun goes down. The outside flows inside, and there’s a good mix of open spaces and secret hideaways – the bar has two nooks that have the feel of a Berber dwelling, and come complete with fires for cold evenings. There are sofas and floor cushions for guests to recline on, and often live music in the early evenings. 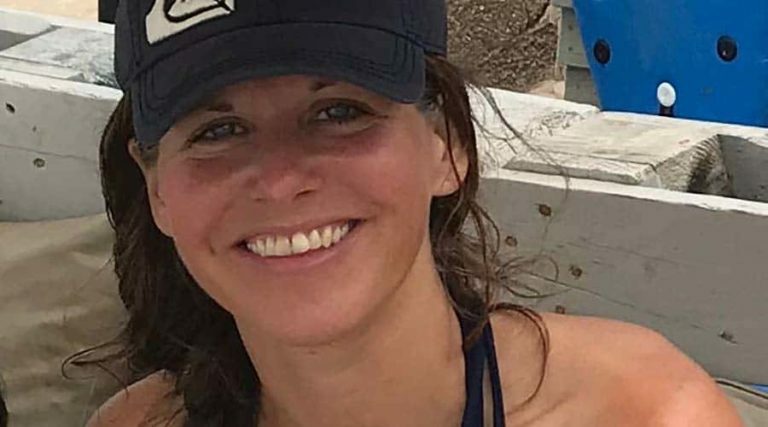 There are two shops – one selling swim and surf gear, the other stocking local food and beauty products, a small selection of clothing, slippers, hammam towels, jewellery and sweets. Pools: The main 12-metre chlorinated pool is surrounded by sun loungers, and there are more loungers and parasols on the beach. There’s a second smaller children’s pool next to the main pool. Most people swim in the sea, so there are usually plenty of space and beds to choose from. The pool temperature is usually 25 degrees, the sea around 19 degrees. Paradis Plage is a mix of modern international style with a twist of traditional Moroccan. Light and shade are a key part of the design, and the lights throw shadows as effective as artwork once the sun goes down. The outside flows inside, and there’s a good mix of open spaces and secret hideaways – the bar has two nooks that have the feel of a Berber dwelling, and come complete with fires for cold evenings. There are sofas and floor cushions for guests to recline on, and often live music in the early evenings. There are two shops – one selling swim and surf gear, the other stocking local food and beauty products, a small selection of clothing, slippers, hammam towels, jewellery and sweets. Spa: The underground spa is within the main hotel building. A series of therapy rooms, hamman and relaxation rooms are connected by candlelit corridors. It’s a cooling and peaceful space to retreat during the heat of the day. Surf House: This has a suitably laidback feel – there’s a bar with a big TV screen and a simple, nearly on the beach café/restaurant. During the day, everyone lounges around on slouchy bean bags; come evening you can sit around the campfire with cocktails or hunker down to watch a movie at the open-air cinema (free showings at 9.15pm – usually in French). The hotel serves local, mainly organic produce in all its four restaurants. All fruit and vegetables farmed are within the region. Fresh fish is bought daily from the fishing village adjacent to the hotel. Children under five eat free everywhere. 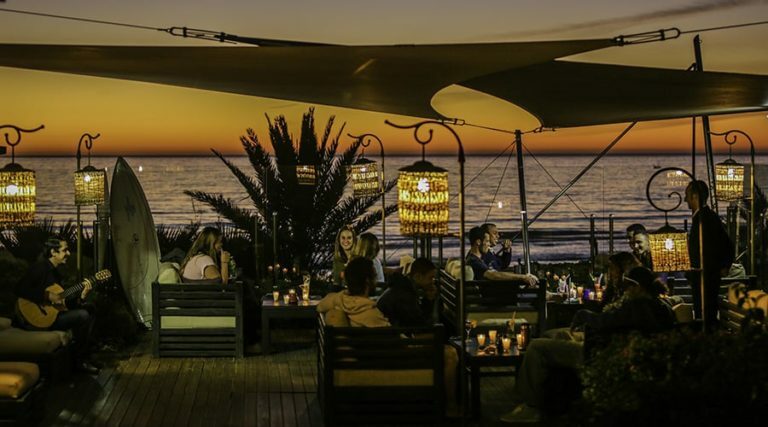 If you’re on a DIY retreat here, Chiringuito is the best offering – their daily changing menu and healthy salads are served al fresco, with the relaxed ambience of a beachside cafe. The portions are large here, with a focus on food being fuel for the multiple activities on offer, so it’s not a place for a detox. L’Ocean is the buffet restaurant with plenty to choose from – retreaters may enjoy the selection of fresh juices, fruit platters, cereals and omelette station. There are also pastries, continental and cooked breakfasts available. 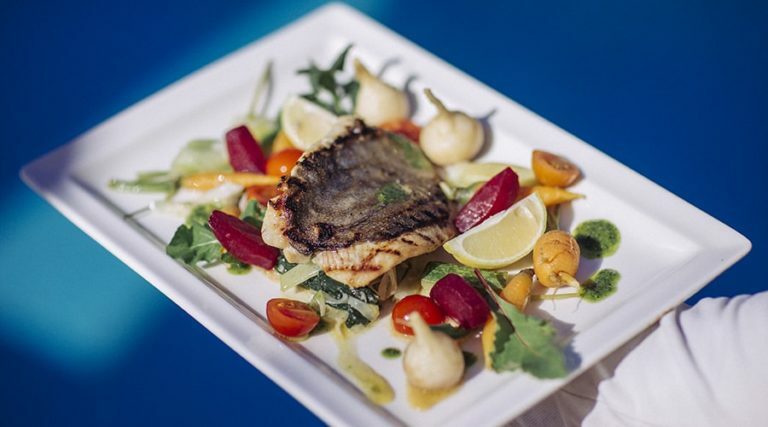 During high season L’Ocean is also open in the evening with a three-course buffet available typically serving a mixture of local tagines, grilled meats/fish and salad dishes. Everywhere else is a la carte. Le Lounge is an outdoor terrace, overlooking the pool and sea with a laidback vibe. It’s designed like a yacht with a sail for shade and wooden planking underfoot. Seating is all low-level couches and sofas around low tables. Open from lunch through to dinner, it serves burgers, club sandwiches and panini alongside more elegant choices (seafood risotto with pan-fried fish; steak with dauphinoise potatoes, bream with smashed potatoes and capers). 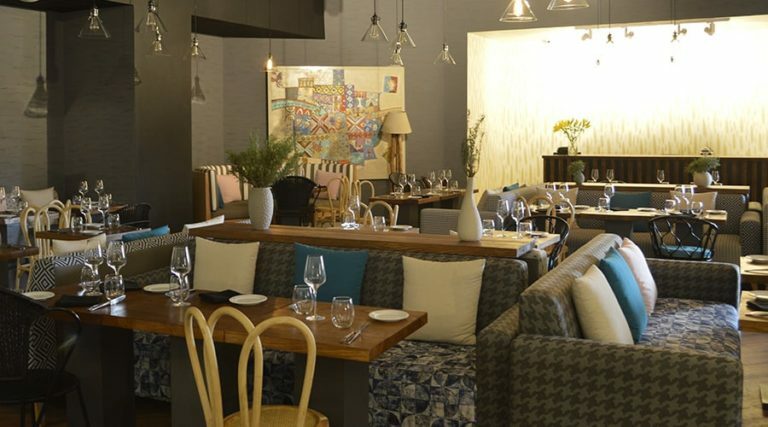 Le 27 is open for dinner only and serves Mediterranean cuisine. It’s an indoor restaurant with a more formal vibe. 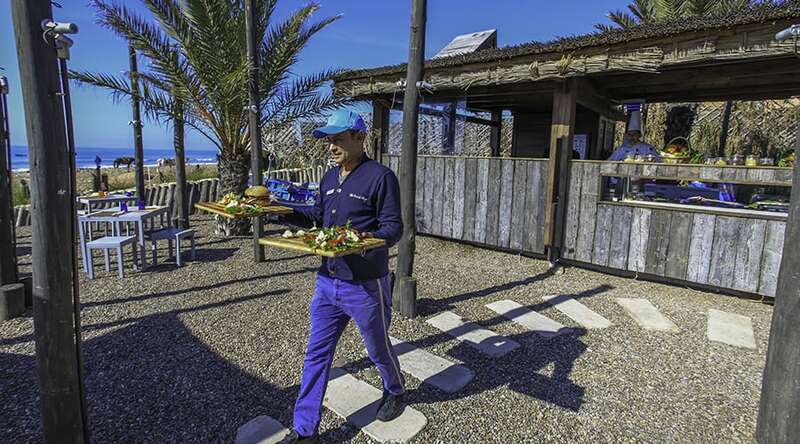 Chiringuito, adjacent to the Surf House, is an open air beach shack-style restaurant. A popular spot for sundowners, lunches and dinners al fresco. The vibe is laid-back and rustic. A chalkboard displays the current menu, including their new Indonesian inspired Poke salad bowls (from 150 MAD), burgers (160MAD) and daily catch of fish from the local fisherman (on request). The drinks menu includes a selection of fresh juices and non-alcoholic cocktails, alongside local and international beers and wines. Paradis Plage still uses single use plastics in the form of drinking straws, plastic bottles in the rooms and small plastic cosmetic bottles for in-room toiletries. They do employ 120 local staff, and they’re working with the ocean community via the Surfrider Foundation, to raise awareness, educate and implement local initiatives. They organize beach cleans, use waste water for irrigation, sponsor young athletes, support local artisans, and have energy saving and recycling initiatives in place.